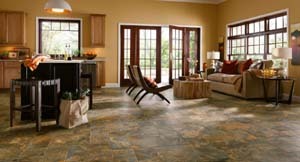 Luxury Vinyl Tile Flooring, What it is! As luxury vinyl tile flooring came into popularity, flooring manufacturers and dealers would group a large number of vinyl flooring products together and refer to all of them as LVT or luxury vinyl tile. Luxury vinyl tile flooring is designed to simulate both natural and man made products such as wood, natural stone, granite, ceramic and attractive designer patterns. Style possibilities are limitless as the pattern that you see is actually an image that has been produced using high definition photography. As of date the American standards organization ASTM International has not established a specification for luxury vinyl tile flooring. 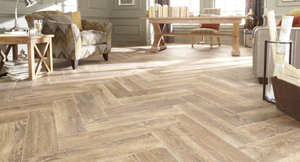 Without an established definition for luxury vinyl tile the buyer needs to be somewhat aware of how this term is being used. Some people in the industry apply the term LVT to vinyl composition tile which is really a stretch. The primary ingredient of VCT is about 65% limestone which is used as a filler material. While a less expensive material, VCT is still a durable product primarily used for commercial installations such as schools, retail stores and other high traffic areas. Vinyl Tile or “VT” is a homogeneous (more uniform) product and referred to as a solid tile material. If you break a “Vinyl Tile” the color is consistent throughout while a vinyl composition tile exhibits its pattern and/or color at the surface. Luxury Vinyl Tile Flooring “LVT” and Solid Vinyl Tile “SVT” have a higher vinyl content than VCT and therefore are less porous yet as durable. Both luxury vinyl tile flooring and solid vinyl tile routinely use a photographic image to provide unique designs. Luxury vinyl tile flooring has made amazing transformation over this past decade. Once, just another vinyl floor covering, luxury vinyl tile flooring and luxury vinyl plank flooring (LVP) is now an important and rapidly growing segment of the floor covering industry. LVT is now available in a large number of shapes, colors, patterns and styles. There are ceramic tile and stone patterns that can be installed with or without grout while offering warmth and softness. For those with pets that are not perfectly potty trained and the pet owner wants the look of hardwood, luxury vinyl tile flooring has you covered. Mostly in plank styles, these products take the abuse without the damage placed on hardwood and laminate from pets. Wood appearing choices are limitless from floors that provide a tabletop appearance to those with deep embossed, distressed texture. Perhaps you are considering a laminate plank but like to wet mop your floor. While you cannot wet mot a traditional laminate floor you can wet mop luxury vinyl plank. Luxury vinyl tile flooring is a perfect choice for children, pets or a husband that tracks in mud or those accidental spills or even teenagers that leave a mess on the floor for mom to clean up. As you can see, luxury vinyl tile flooring is not just another floor, LVT is a floor that offers style, durability and ease of maintenance and is worth considering for most any flooring project. 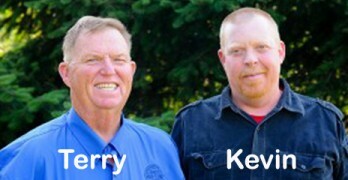 Article by, Terry Weinheimer a nationally recognized flooring and floor covering inspector and consultant.